Available in a variety of sizes, the Grant Vortex is suitable for a wide range of household installations, from space-saving to high-output models. 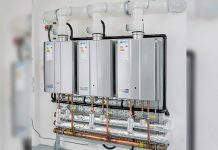 The Grant Vortex range consists of high-efficiency, free-standing internal oil-fired boilers designed for utility, kitchen and boiler house installation. The boiler features an award-winning, stainless steel condensing heat exchanger and boasts a SEDBUK Efficiency of 92.6% – 97%, making it an innovative and cost-effective heating system for the home. 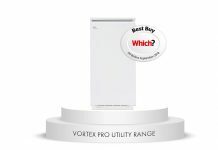 The compact design and whisper-quiet operation ensures that the popular Grant Vortex 50-70 indoor utility model is ideal for installations in kitchens and utility rooms. Another member of the Vortex family, perfect for internal use, is the Indoor Wall Hung Vortex, with its wall-mountable application for optimum space-saving in the household. In terms of outdoor use, the Grant Vortex boiler house model can be positioned in a boiler house or garage. 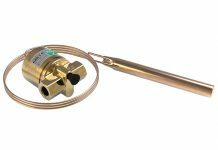 In addition, the Vortex Module is suitable for placing outside the property, providing a convenient maintenance feature, which means that the boiler can be serviced without disturbing home-owners, who do not need to be at home for the servicing visit. The Grant Vortex range expanded this year with the launch of the brand new, state-of-the-art Vortex Blue Max, which uses a Riello Blue Flame burner, creating a market-leading combination that gives customers an easy-to-install, reliable product with all-important low emissions. 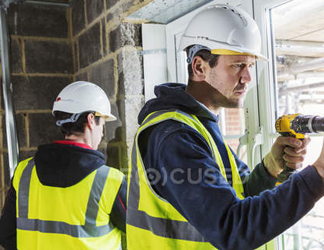 Due to its suitability for social housing, the compact nature of the product and its appeal to a mass market, the Vortex Blue Max will benefit various property sizes. This cutting-edge range is available in heating outputs of 26kW and 36kW and in internal, external and combi models. The boilers are also compatible with all Grant EZ-Fit flues.